For a limited time Len Wallis Audio is offering a trade on for owners of existing Sonos Connect and Sonos ZP100 amplifiers. Get $250 trade-in on any working Sonos Connect Amp. Get $150 trade-in on any working Sonos ZP100 Amp. 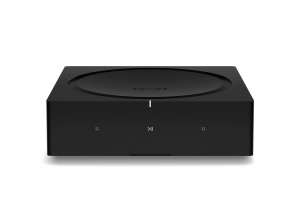 The Sonos Amp fills the same roll as the Connect:Amp (or the ZP100) in that you can connect up to four non-powered speakers and a powered subwoofer. It also gives you a set of RCA analog inputs for an external audio source, like a turntable (please note though, that it does not include a phono stage). The big difference from it’s predecessors is power. The previous 55 watt-per-channel Class-D amplifier has been upgraded substantially to a much more powerful 125 watt-per-channel unit. This means a much wider range of speakers can now be powered by it and better sonic performances, especially at high volumes.